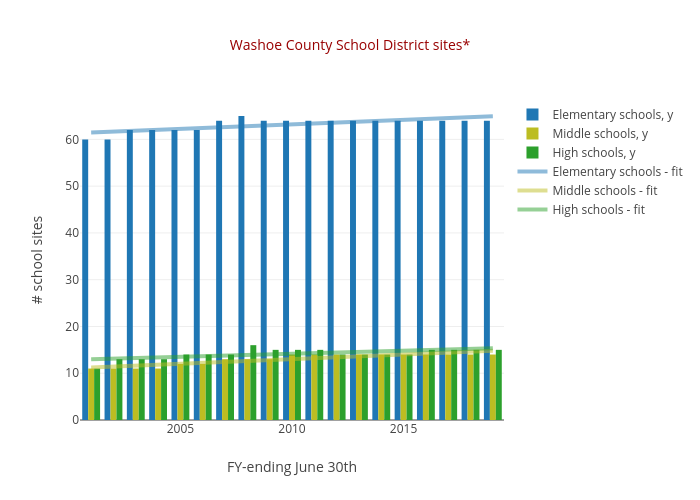 Truckeemeadowstomorrow's interactive graph and data of "Washoe County School District sites*" is a bar chart, showing Elementary schools, y, Middle schools, y, High schools, y, Elementary schools - fit, Middle schools - fit, High schools - fit; with FY-ending June 30th in the x-axis and # school sites in the y-axis.. The x-axis shows values from 2000.5 to 2018.5. The y-axis shows values from 0 to 68.42105263157895.